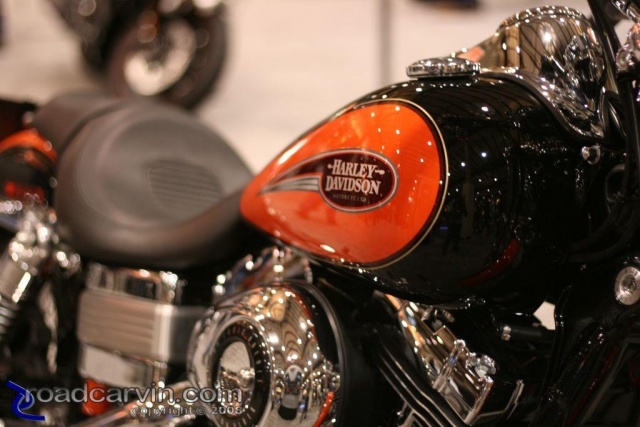 The 2007 International Motorcycle Show in San Mateo featured the expected assortment of motorcycle manufacturers, accessory vendors, and crowds. Manufacturers large and small were in attendance, presenting their latest offerings to an eager crowd. The weather was superb compared to past years' events; event organizers claim over 41,000 in attendance - the motorcycle parking lots were full all weekend. 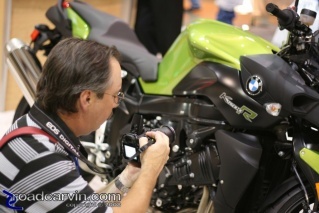 Close-up: Dwight prepares for a macro shot on a BMW K1200R at the 2007 Cycle World International Motorcycle Show in San Mateo. These events are offer a good opportunity to try out bikes and accessories from many manufacturers in one place - motorcycles, helmets, jackets, gloves, you name it. Some manufacturers had other product lines on display: personal watercraft, generators, and the like. Whatever your interest in motorcycling, it's a great opportunity to immerse yourself in motorcycle and motorsports technology. Dwight takes a moment to answer questions for one of the BMW workers at the 2007 International Motorcycle Show in San Mateo, California. Cobra Give Away: Cycle World will give away this Suzuki M109R customized by Cobra Engineering Special Products Division at the conclusion of the IMS series. The Cycle World International Motorcycle show, presented by Toyota, coming to a city near you. This image was uploaded with the post Dyno Tuning in Stockton, California - Dream Rides, Inc..